The struggle of Palestinians takes different forms, between living under the Palestinian Authority or the de-facto Hamas government in the Gaza Strip. Palestinian protester near the border between Israel and Gaza Strip on the 23rd of November 2018. Picture by NurPhoto/SIPA USA/PA Images. All rights reserved. While the international community is concerned about the ongoing round of escalations between Israel and Hamas in the Gaza Strip, the Palestinians in the West Bank fight on another front. The escalation in the Gaza strip, albeit seeming to be between the Palestinians living in the Gaza Strip and Israel, is also a silent struggle against the de-facto rulers of the Gaza Strip, namely, Hamas. As of early September, the Palestinians in the West Bank have taken to the streets, protesting against the new Palestinian Social Security Law (PSS), proposed by the Palestinian Authority. Since the establishment of the Palestinian Authority, there have not been such protests against any of the dozens of proposed laws and regulations. Simply, because this law touches on people’s livelihood. The law deducts from their salaries and provides the money to an untrusted institution to manage and invest. PSS which was approved and signed by the Palestinian president in 2016, without any public consultations or deliberations in the malfunctioning Palestinian Legislative Council, was faced with considerable criticism due to the very obvious gaps that do not meet the needs of Palestinians. The critiques range from civil society organizations, human rights organizations, journalists, and private sector. Recently, trust between the Palestinians and the PA’s institutions has declined sharply. According to the Arab Barometer, in 2016, more than 65% of the Palestinians had no trust in the government. In 2007, 31% of Palestinians had great trust in the government, by 2016 the number had already dropped to 6%. Also in 2016, a majority of Palestinians, 56% to be precise, showed distrust in the courts and the legal system. This data snapshot does not appear from a void, but rather as a result of a set of factors that have undermined the relationship between the PA’s institutions and the Palestinian people. The main factor is the corruption within the PA, which has been transformed into a limited corporation for a particular group of people around the current President and his notoriously corrupt Prime Minister. In 2016, more than 90% of the Palestinians believed that there was corruption within the PA, compared to 67% in 2007 and 72% in 2011. Recent evidence shows that many of the sons, daughters, and relatives of senior officials within the PA are being appointed, either in the diplomatic corps or in Ramallah. In 2018, scholarships for postgraduate studies were given to sons and daughters of PA senior officials, ignoring the Palestinian students who are in urgent need of such assistance. Although these incidents of corruption are very common, the PA officials do not care about the reactions of the Palestinians. Another factor is the political deadlock and the end of the peace process. These in addition to the inability of President Abbas to present a new national agenda played a factor in forcing him to eradicate his opponents, such as Mohamed Dahlan, and others within the ruling party, Fatah, and the Palestinian Liberation Organization. According to Varieties of Democracy Institute data at Gothenburg University, Abbas has secured all means of power in his hands, which makes him nothing less than a dictator. Besides that, Abbas’ constant carelessness towards the National Council resolutions, and his verbal attacks against his colleagues within the PLO have put him in a position to be a single authority. All that is added to his failure to achieve national reconciliation. In addition, the last two years witnessed intensified security measures against freedom of expression. On many occasions, the PA security forces used excessive force, physical harassment, imprisonment, and illegal detention against their opponents, and protesters. According to a Human Right Watch report that was published in October, “serious crimes have been committed in Palestine by the Palestinian Authority and Hamas.” HRW invited the ICC prosecutor, Fatou Bensouda, to consider arrests and treatment in custody of detainees by the PA and Hamas as part of any future investigation into the situation in Palestine. Above all, in the last year, Abbas intensified his measures against Hamas in the Gaza Strip; however, he imposed a collective punishment against the Palestinians living in the Gaza strip who used to work in the public sector within the PA before 2007 when Hamas took over the Gaza Strip. His moves led to colossal criticism by all parties including Fatah. In June, hundreds of Palestinians took to the streets against the PA’s sanctions, calling for the halt of sanctions against the Gaza Strip. The demonstrators were met with an iron fist, where many where detained and injured. Later, in September, the struggle of the people in the West Bank shifted against the new social security law, leaving the Gaza Strip facing its faith alone. In social media as well as in streets, thousands showed opposition to the law. The law does not protect the people, and the history of the PLO is proof that the people’s money, taxation, and savings are not protected. There are many precedents that prove the opacity in terms of people’s salaries. According to the State Audit and Administrative Control Bureau, 60% of 17 million Israeli shekels, which are the financial income from the General Organization of Workers in Israel (Histadrut), to the General Union of Workers in Palestine (GUWP) were allocated to general administrative expenses’. This means that Palestinian workers’ savings which were supposed to be invested by GUWP have been misused. According to Akram Ijla, a previous general director, and public servant within the PA from 1994, no one can ensure that the people’s money will not be stolen or wasted. He argues that in 1994, the Palestinian Authority took over the social security fund which was part of the Egyptian and Israeli civil administration in Gaza since 1950s. “They took almost 237 million USD, which is the great majority of the fund, with the aim to invest it but then nothing happened, and the money disappeared, and no one spoke about it until today”. The Palestinians in the West Bank have been tamed. They care more about their livelihood and source of income to secure their bread and to cover their hugely expensive living costs, as a result of the neoliberal economy. Today, people’s struggle against the PA is a priority while the struggle against the occupation comes second. In the Gaza Strip, the struggle is slightly different. The Great Return March, which started in March 2018 was a result of the bankruptcy of possible usage of violent means by the de-facto rulers in the Gaza Strip. Although the idea came from independent activists, who were honest in their non-violent strategy, the march, later, was hijacked by Hamas and became violent. 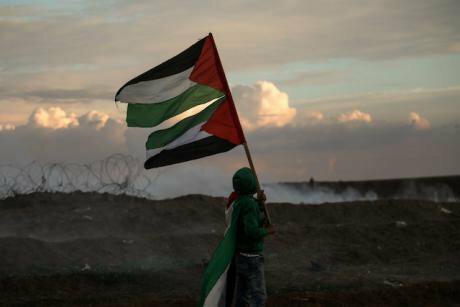 The people’s struggle for political gains amid the efforts to sustain their power in the Gaza Strip, and their seeking international recognition as the sole legitimate ruler of the Gaza Strip, was exploited. The Great March has shown a conflicting account among the Palestinians in the Gaza Strip. On the one hand, there are those who condemn Hamas tactics, argue that Hamas is swapping the blood of the innocents in the Gaza strip for partisan gains, and on the other, there are those who believe in the novelty of the march. During the ongoing political division, the Gaza Strip has witnessed three major slaughters, while being besieged by the Israeli army. Hamas did not master how to maneuver politically according to the regional and international power dynamics, and therefore, it took the Palestinians in the Gaza Strip as hostages. The results of Hamas’ political childishness and rejection of any efforts for reconciliations with Fatah, were overwhelming on the people of Gaza. Corruption increased, the siege hardened, and severe destruction ensued. Furthermore, this provided the Israeli extremist government with a pretext to continue besieging the Gaza Strip. Hamas is accused by the Palestinians in Gaza of misusing public money and international aid. Until recently, the power cut in the Gaza strip amounted to more than 19 hours daily. Recent developments in truce talks between Hamas and Israel, mediated by the UN and Egypt, resulted in fuel trucks being allowed to enter the only Gaza power plant. This time, Israel imposed one condition: the UN must monitor and accompany the fuel trucks from the entry point to the operating rooms. Nowadays, the Gaza power cut is less by few hours a day if it happens. The same amount of fuel used to enter many times a year. Therefore, Gazans ask, where did it go, and who stole it. Many answers: the de-facto ruler did that. It was sold privately to the Gazans, and private power generator owners. Another example is the Gaza Rafah crossing. If a Gazan needs to travel, they either have to wait lengthy periods or pay to Gaza’s de-facto government officials, as a bribe to facilitate their exit by letting them in the first buses leaving the Gaza strip. As someone from Gaza, who has been following Gaza affairs routinely, I believe that Hamas has not changed its mind as a party; instead of as a rebel government, Hamas continues to think of its own members, and most importantly, the senior members. They perceived the people of Gaza, as an investment opportunity by diverting international aid, and humanitarian assistance to their benefit. In many cases, international and Arab humanitarian aid were privately sold or distributed to Hamas members. The de-facto government imposed a different layer of taxation over goods that enter the Gaza Strip, either from Egypt or Israel. A close friend informed me that a cigarette box from Egypt costs less than one USD. At the same time, Hamas sells the same type of cigarette for at least four USD. Almost all imported goods have high taxations, which go to Hamas’ budget. In Gaza, the people’s struggle is shaped by two factors: the political division that humiliates them and their livelihoods, transforming the majority of them into people who live in extreme poverty, and the second factor is the occupation that strips them from their humanity, restricting their movements, killing them, and making the Gaza Strip an uninhabitable place. Therefore, Gazans did not take to the streets against the social security law, but marched to the borders, against Israel, and also against their lives. Many protestors informed me secretly that they went because they find death by the Israeli soldiers better than the slow death in the Gaza Strip or suicide. Along the lines of "we live because of lack of death." The Palestinian struggle is not only a struggle against the Israeli occupation, rather a struggle against the corrupt de-facto governments and authorities in both the West Bank and the Gaza Strip. Their struggle takes different shapes and forms, amid the diminishing likelihood of an independent state, and the increasing police-ization of the Palestinian Authority and the de-facto government in the Gaza Strip. In conclusion, Palestinians everywhere have their own different struggle. In the West Bank, the Gaza Strip, Israel, Lebanon, Syria, the rest of the Arab world and in the diaspora. These struggles share one thing, political divisions.